The mass adoption of Social Media together with the proliferation and widely usage of multi-connected companion devices have tremendously transformed the TV/video consumption paradigm, opening the door to a new range of possibilities. 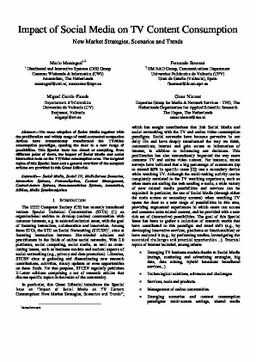 This Special Issue has aimed at analyzing, from different point of views, the impact of Social Media and social interaction tools on the TV/video consumption area. The targeted topics of this Special Issue and a general overview of the accepted articles are provided in this Guest Editorial. Montagud Climent, M.A, Boronat, F, García-Pineda, M, & Niamut, O. (2015). Impact of Social Media on TV Content Consumption: New Market Strategies, Scenarios and Trends. IEEE Computer Society STCSN E-Letter, 3(2).